One year to the day that the world’s best cyclists descend on region for the Tour de France, staff from a York hotel will be undertaking their own “Grand Départ” challenge. 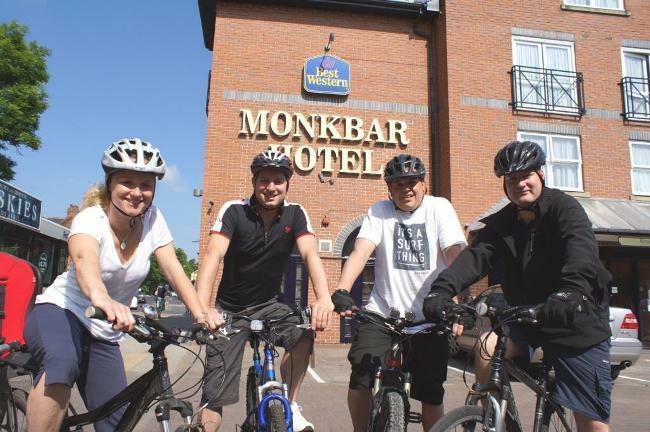 Up to ten employees from the Best Western Monkbar Hotel will be aiming to cycle the entire distance of the legendary race’s Yorkshire heat – some 242 miles – in just one morning! However, the task is not as gruelling as it first appears, as the team will combining their mileage to make up the distance, and they will be peddling along the relatively flat York-Selby cycleway instead of the hilly Yorkshire Dales. The team, led by Monkbar Hotel general manager Graham Usher, are undertaking the challenge in aid of Martin House Children’s Hospice, a charity it has support for the past six years. “The Tour de France is the biggest event ever to come to the Yorkshire region, and, even though we are still a year away, the excitement is growing by the day. “We are staging our own Grand Départ on Friday, July 5, 12 months to the day the cyclists will be heading out from Leeds on the first day of the race. “For our cycle challenge, there will be up to ten us, and we are peddling to raise pounds for Martin House along the very picturesque York to Selby cycleway. “We are setting off at 10am and aim to complete the combined distance of 242 miles in under four hours.